This large, airy and comfortable owner/managed restaurant, which is now established for over 6 years, has become the focal point for diners looking for a high quality place to eat in the Ewell area. Whilst the menu offers many popular favourites – Tandoori, Balti, Biryani and a range of curries - the chef has developed many of his own speciality dishes based upon traditional methods of food preparation and recipes from his home country. The welcome is warm and friendly, the service professional and the prices very affordable. Open every day (inc. Bank Holidays) noon-2.30pm and 6-11pm. All major credit cards accepted. No service charge. 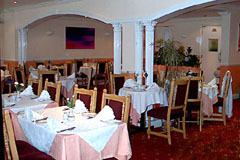 Traditional and authentic Indian and Bangladeshi dishes.